Imagine a health debate where ministers promised that at least 15% of cancer sufferers will receive evidence based proven medical treatments. Or that they were hoping that at least 25% of expectant mothers will get access to safe childbirth. You would rightly think that we are talking about a very poor level of healthcare access. But if you apply this to access to psychological therapies by people suffering from common mental health conditions, this is where many developed economies are today, in 2017! Cost of mental health conditions is estimated to be~£100b in the UK and about ~£300b in USA. If you are reading this in the UK, you have reason to be optimistic because UK has come a long way from 2008 when IAPTS programme was set up, with the ambition of treating 15% of ~6m people who develop mental health problems every year. The programme has been a success and now almost all UK regions are approaching this target (even though the quality of treatment is below target). Emboldened by success, this target has now been raised to 25%. If you are reading this in the USA, things are only a little bit better. Up to 40% of insured patients get treatment but between 15 to 20% mental health sufferers are uninsured. CBT (Cognitive Behaviour Therapy, also known as ‘talking therapies’) have a long history of being effective in most common mental health conditions and in a large number of cases, CBT works better than pills (including the pop culture icon, Prozac). Despite CBT being the preferred option for most, in most situations and in traditional model of care, is hard to deliver at scale. Patients have to meet with their therapist for several sessions and there are huge gaps between demand and supply. Furthermore, it is hard to measure quality of CBT; because of the nature of treatment, it is hard to monitor individual performance of therapists. Digital technologies, when applied to this specific problem has shown to improve access as well as quality of CBT. UK and USA based Ieso Digital Health is a leading provider of synchronous, therapist led, technology enabled CBT at scale. It is UKs biggest provider of digital CBT with a track record of successfully serving thousands of patients in UK and USA. Ieso’s proprietary, clinically validated method of delivering CBT has been shown to have better outcomes than face to face CBT inrandomised controlled trials. Ieso’s product is much more suited for people who want to start treatment quickly and want the ability to have greater control over time and location of their treatment. Ieso offers treatment via a chat like interface which helps patients to be less inhibited and makes interactions more productive. Ieso also uses powerful computer aided analytics techniques including machine learning and natural language processing (NLP) to identify most suitable therapists for each patient and to ensure quality control over interactions between the patients and therapists. Ieso Digital Health has raised £18m (~24m) in equity financing from my fund, Draper Esprit along with existing investors, Touchstone Innovations and Ananda (Social Venture Fund). The Company plans use this capital to fund further product development and expansion in USA and UK where it is already serving patients. Ieso’s product is unique in being clinically validated in randomised controlled trials and being able to utilise modern analytical technologies to improve outcomes and to reduce treatment length. 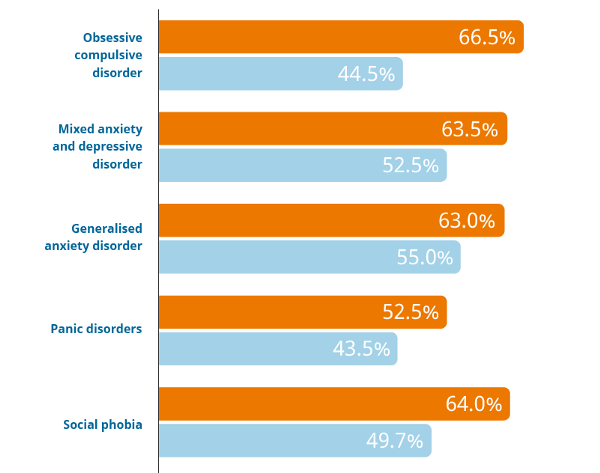 While improved technology and digital delivery are important for good quality accessible care, there are important aspects of the social and policy environment around mental health which are also playing an important role in how we address this problem. At the policy level a number of initiatives have pushed for treatment access. In the UK, Health and Social Care Act 2012, established ‘parity of esteem’ for mental and physical health. In the USA, since 2010, Mental Health Parity and Addiction Equity Act (MHPAEA) has been in force which required insurers to cover mental health conditions in the same way as physical health conditions. At many levels, social stigma of mental illness remains but it is not the same as it was even a few years ago. It is now increasingly common for people to publicly speak about their struggle with mental health conditions and/or encourage others to seek help. These include initiatives like Heads Together supported by William Arthur Philip Louis and Lady Gaga. Large and growing unmet need, rising awareness, unique and validated technology platform, coupled with experienced global team form the basis of our investment thesis for backing Ieso. We are delighted to welcome Ieso to Draper Esprit family.